Because nothing in life is perfect (besides the cool blue gaze of the divine Aaron Rodgers, natch), when there’s a security problem with a technological product, companies are usually pretty grateful to have it brought to their attention before too much damage can be done. Which is why Microsoft is currently offering a hearty “thanks!” to a five-year-old boy. 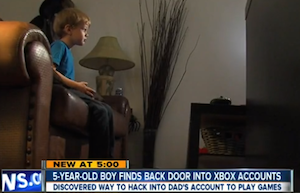 Yes, a boy who likely just learned to tie his shoes cracked the Xbox One’s password verification system accidentally while he was trying to log into his dad’s Xbox Live account. He was being a naughty kid and playing games he wasn’t supposed to be, and his father finally caught on. But instead of being mad, reports ABC 10 in San Diego, his father wanted to find out how his kid had gotten around the password screen. He shot a video, asking his son how he’d done it. His son gets excited and shows his dad that all he had to do was type in a wrong password for the account, and then hit the space key a few times before hitting enter on the password verification screen. Boom, he’s in. His father happens to work in computer security himself, so he’s pretty proud. This boy is an overachiever already — his dad says he’s figured out vulnerabilities three or four times in the past, staring when he was one and he got past the lock screen on a cellphone by holding down the home key. The father reported the glitch to Microsoft, which has acknowledged the problem and come up with a fix. The company even gave a nod to the boy on their list of security researchers that have helped Microsoft. For his good work, the boy will get four games, $50 and a year-long subscription to Xbox Live — his very own, so he won’t have to crack any more passwords… for now. Previous Should Online Publishers Block Users Who Install Ad-Blockers?